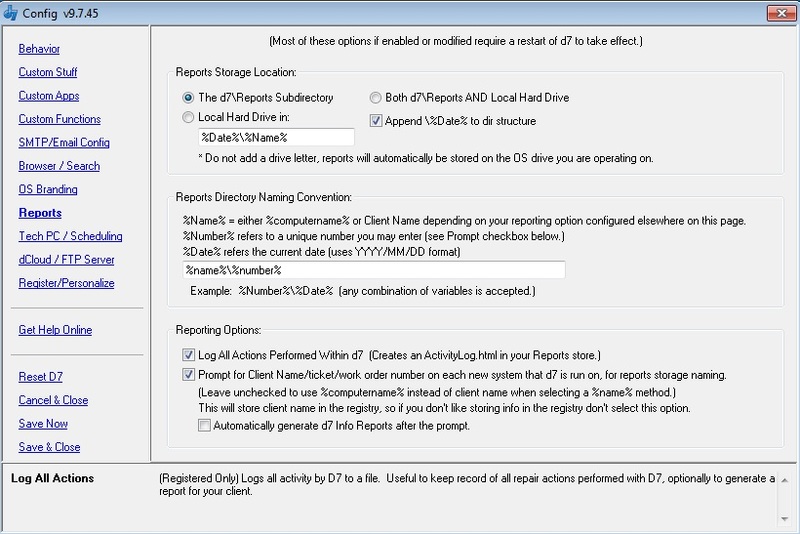 d7Reports – stores all reports in the Reports subdirectory of wherever D7 is being run from. Store Locally Only – stores reports in your configured local storage directory on the Operating System partition that D7 is currently operating on. Store in d7Reports AND in the Local Dir – stores reports both in d7Reports and the reports directory specified below. Local Store Dir – the directory to store reports on the Operating System partition that d7 is currently operating on. By default if an option is configured to store reports locally and no directory is specified here, the reports will be stored in SupportReports. Never add a Drive Letter in this configuration, the drive letter of the operating system partition that d7 is operating on will be automatically added by d7. Reports Directory Naming Convention: Configure how d7 organizes stored reports when stored within the d7 directory. Log all Actions performed by d7 – Every action performed in or by d7 will be logged to the reports directory in a file called “Activity_Log” which begins as a TXT file but gets converted to HTML when viewing. Useful to for technician reference as to all work performed on the system. Useful to give to clients as a report of what work was performed on the system. The verbiage of the logged actions can be altered by editing the ActionLanguage.INI file found in the d7 directory. This is a Premium feature only. On each new system that d7 is run on, for the first run you will be prompted for the client’s name and/or a ticket/work order number. This name would then be used as the %name% and %number% variables when storing reports within the d7 directory. When unchecked, the %name% variable will be the current %computername% variable on the system, and the %number% will simply be represented by a single x. This option does write the client name to a section in the registry for future usage / multiple d7 launches, so d7 knows not to prompt you for the name again on the same system. If you do not like leaving information in the registry, then do not use this feature. This option writes the number specified here not in the registry but in the d7.ini file, for other reasons. Automatically Generate Info Report after the prompt – this option will do just that, generate d7’s Info_Report.HTML on the system immediately after this prompt.